Home » They’re back…ticks that is! 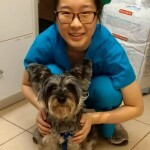 We usually have a bit longer before these nasty critters start showing up, but in the past 2 weeks both little Maya and our own Dr. Sam’s dog Abbey picked up ticks during visits to Cherry Beach. Many ticks carry bacteria that cause Lyme disease, ehrlichiosis, and other infections, and they transmit these diseases to dogs when they latch on and start feeding. After finding the tick, Dr. Sam gave Abbey her first tick preventative treatment earlier than she had originally planned, and she recommends that other dog owners make an appointment to come in and talk to the vets sooner rather than later, so that at-risk dogs can start a tick preventative early as well. That way if they pick up a tick, they will be protected – it will die when it bites them, before it can start feeding and transmit a tick-borne disease. The last picture shows a tick on one of our canine patients this past October. 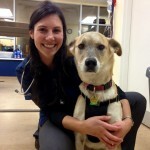 It is important to check your dogs (and yourself!) all over after going for walks in grassy or wooded areas, since these are the types of environments where ticks search for hosts to attach to. As you can see though, ticks are very small, and can easily evade detection – particularly on dogs with long hair or dark coats! Most owners whose dogs test positive for a tick-borne disease don’t recall ever seeing a tick on their dog! your dog is infected, we can catch and treat it early. 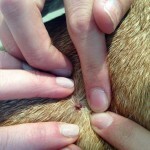 If you find a tick on your dog, call us right away so we can advise you on what to do. It is important to remove ticks as soon as possible to reduce the risk of disease transmission, but they need to be removed carefully – otherwise you risk accidentally injecting the tick’s saliva into your dog, and actually increasing their risk!